Here's the thing. I love body wash. At any given time, I have about 16 in my shower! And this week, I'll be bringing you some of my newfound favorites. 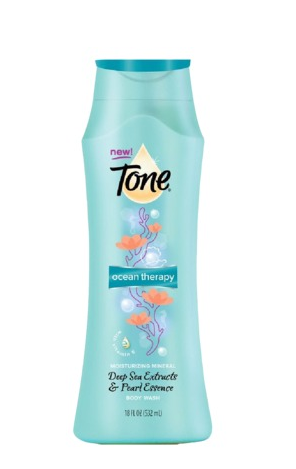 Up today: Tone Ocean Therapy Body Wash.
Want a body wash that smells fresh, clean and, yes, like the ocean? This is the one for you. The huge (18 fl. oz.!!) bottle is filled with a body wash that pours easily onto a pouf, lathers up incredibly well and makes you long for your next beach vacation. Precious pearl, sea kelp and Vitamin E combine to moisturize and nourish your skin, even if it's drier than the Sahara -- which is how mine has been all winter and spring! The scent is crisp with a touch of feminine and just brightens up your shower in an instant. 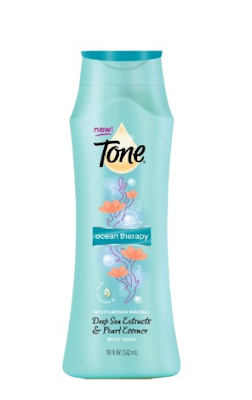 Tone Ocean Therapy Body Wash retails for $5 at drugstore.com.